Plant the Terracotta Yarrow in your garden and attract butterflies all summer. New achillea flowers of this flowering perennial open in shades of yellow to peach maturing to the color of a terracotta pot. This colorful introduction by Ernest Pagel loves full sun and poor soil settings. 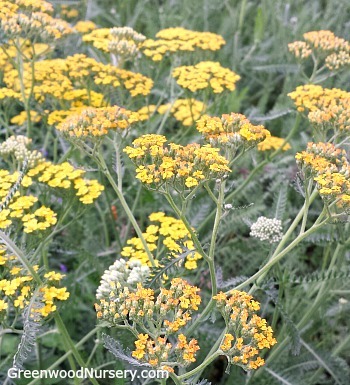 Achillea Terrracotta is a great addition to any full to partly sunny gardens. Companion plants for achillea are butterfly bushes, lavender plants, coneflowers. Terracotta yarrow ships in its one gallon container. Orders shipping to AZ and CA will be bare rooted before being prepped for shipping.